The Sunday worship service or "Episcopal Liturgy" incorporates the earliest known Christian and Hebrew ceremonies. 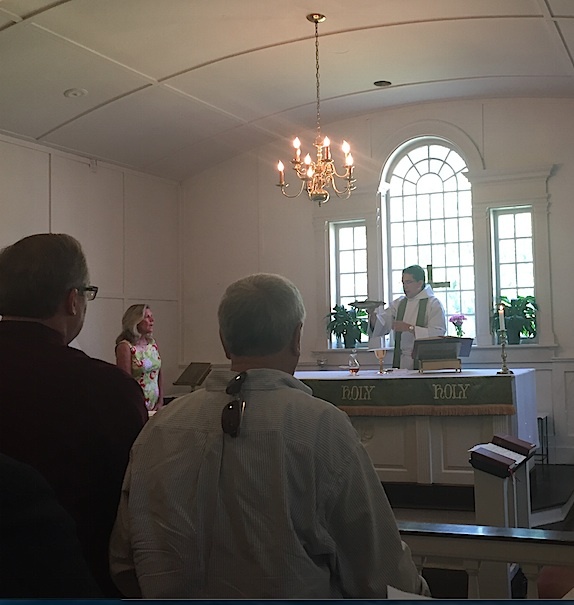 Throughout Episcopal churches, and likewise at Holy Spirit, the worship service is divided into two parts. The first is the Word of the Lord, during which we listen to Scripture and wonder about its meaning. The second is Holy Communion (or Holy Eucharist) during which the priest consecrates the bread and the wine. We eat the broken bread and share the one cup as a sign of unity in faith and taking our place in the one Body of Christ, the fellowship of all believers. At Holy Spirit, we have two Sunday worship services (September to June). Our 8:00 a.m. Eucharist is an intimate, contemplative service which takes place in our chapel. At our 10:00 a.m. Eucharist, adults and older youth assemble in the church for the Word of the Lord, and children and younger youth attend Sunday School to hear “the Word” in an age-appropriate way. Everyone comes together to celebrate Holy Communion. After the service, a parish family hosts an informal coffee hour for fellowship.